Angelo Morado and Marianna Vargas met during their sophomore year in high school and were introduced by Marianna’s cousin Rocco. “However, we only started dating during our freshman year of college. Then, we were together for nine years before making it to the altar,” says Marianna. Angelo proposed in South Korea, on a trip they took with some of their closest friends. “He proposed by the riverbank of Nami Island,” recalls Marianna. Nami Island is famous for both its lush, natural beauty and because scenes from the 2003 Korean drama “Winter Sonata” were shot there. It was only fitting that this romantic location was where Angelo proposed. The ceremony could have taken place in a number of places, but it was important for the couple that both sets of grandparents be present, so they decided to hold the wedding in Manila. “Our ceremony was in Santuario de San Antonio and our reception was in Marquis Events Place in BGC,” says Marianna. Marianna wore a Rajo Laurel gown, which included elements from her own mother’s wedding gown. 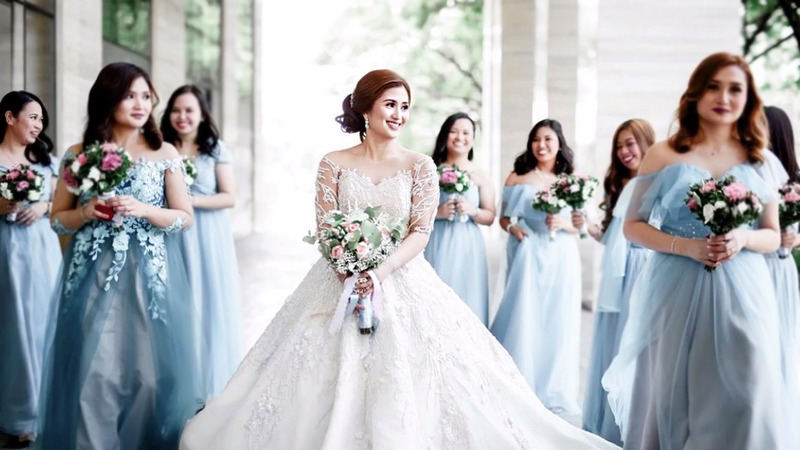 “Rajo skillfully lifted all the lace from my mom’s gown to create my wedding gown and used whatever leftover fabric for my despdedida de Soltera dress,” she shares. More family elements were present in the wedding, from the rings given by Angelo’s mom, to the giveaways from Angelo’s brother Mikee, and the cake made by both Miguel Vargas of Bucky’s fame and Marianna’s brother, and Ginny Vargas, Marianna’s godmother. It was truly a family affair.